Muffin, owned by Paula Terry (Acquisitions, Cataloging, and Administrative Support Coordinator), reading The Littlest Sled Dog, by Michael Kusugak, illustrated by Vladyana Krykorka. 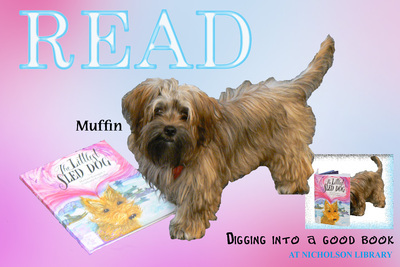 Terry, Paula and Nicholson Library Staff, "Muffin READ Poster" (2009). READ Poster Gallery. Image. Submission 63.